After reading theology in Lausanne where he attended the lectures of Alexandre Vinet – he remained one of his fervent disciples all his life – and studied in several German universities. He was ordained in 1847 at the Chapelle Taitbout and will remain pastor of this well-known Parisian Free Church all his life. The Revolution of 1848 and the beginning of the Second Republic gave him the opportunity of entering the political arena – at least to some extent – and showed himself to be « the socialist middle-class man he always was » (le bourgeois socialiste qu’il fut toujours). In a letter dated 21 March 1848 he describes the « people » at the Hôtel de Ville (Paris town hall) : « one got to know better this intelligent, vivacious, witty and kind race of men, as words of agreement were to be heard from all. Only one discourse was on all lips : a pitiful picture of dire poverty and of servitude that sounded like a peaceful indictment but whose conclusions were more imposed than advised. I was flabbergasted by the oratorical skills of our smock-clad people. » (on apprenait à connaître cette race intelligente, vive, spirituelle et bonne, car les mots de concorde sont dans toutes les bouches, lamentable tableau de misère et d’asservissement, réquisitoire pacifique pour le ton, mais dont les conclusions étaient plus imposées que conseillées. J’ai été confondu du talent oratoire de nos gens en blouse – E.G Léonard, Histoire Générale du Protestantisme , t.III, p.261). His intelligence and his devoted attention to social issues and to politics, his brilliant style and the articles he published in Le Semeur quickly made his name well-known. ‘Christian Journal’, dir. by John Vienot, Free Faculty of Theology, Paris, from 1854 to 1926 © S.H.P.F. From 1854 he is editor in chief of La Revue Chrétienne (The Christian Review). He is a leader of the evangelicals and among the most brilliant adversaries of the extremist liberals. But the expression of his faith was not as sombre nor obsessed by the horror of sin as was the case with some “revivalists”. Very bright, he read German fluently, and he kept informed of the German theological publications .However, he was not a theologian in the strict sense of the word, he was a fast writer who did not always avoid mistakes and omissions. 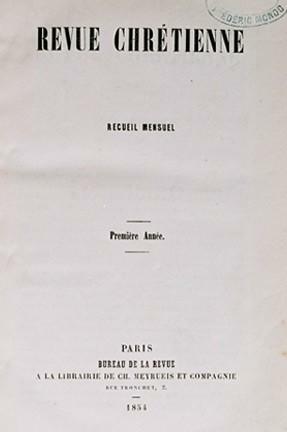 In the Revue Chrétienne, published with a theological supplement that became the autonomous Revue Théologique in 1870, he aimed at improving theological culture of the evangelicals. He declared that it is possible to be well-read and intelligent while remaining favourable to traditional doctrine. This, in fact, had been questioned by Le Lien (The Link), Colani’s periodical published in Strasbourg. Edmond de Pressensé published several books on the history of the Church (Histoire des trois premiers siècles de l’Église chrétienne-History of theChristian Church in the first three centuries). He gave a number of lectures in France and abroad. His work Jésus-Christ, son temps, sa vie, son oeuvre (1866)-(Jesus-Christ, his time, his life, his work–1866) was undoubtedly the best answer to Renan’s La Vie de Jésus 1863 (The life of Jesus) and was to bring him many friends among liberal Roman Catholics. With the liberalisation brought about by the Second Empire, he became Thiers’ friend. During the 1870 war with Germany he enlisted as an ambulance driver for the Société Internationale d’Assistance aux Blessés (International Society of Assistance to the Wounded). In July 1871 he was elected deputy (centre- left) and, while maintaining his ministry at the Chapelle Taitbout, he embarked on a political career. He was not re-elected in 1876 and, having defended his D.D thesis in Montauban in 1877, he had hoped for a Professorship at the Divinity School of Paris. But Dean Lichtenberger was opposed it. In 1883 he is elected life senator. 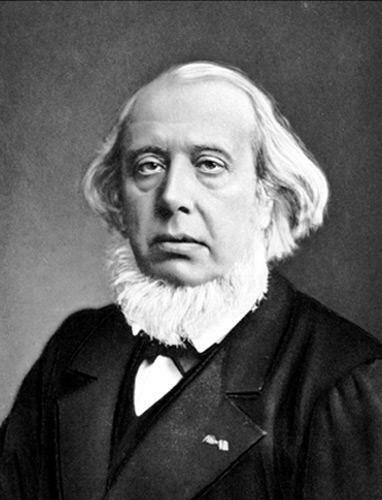 In 1890 he was elected to the Académie des Sciences Morales et Politiques. By his wide knowledge and his numerous writings, by the diversity of his commitments and his activity in the Protestant Press, Edmond de Pressensé is one of the most important personalities of French Protestantism in the second half of the 19th century. He was the father of Francis de Pressensé, député for the Rhône department and first president of the Human Rights League.